Have you ever thought about all that your handbag goes through daily? From exposure to toilet floors, kitchen counters and public transportation to name a few, handbags pick up many germs with use. Scientific tests have proven that a handbag can carry more bacteria than your average toilet seat! Gross right? Then if you think about how bags are handled, it’s easy to see how these germs could be transferred onto other surfaces and spread contamination. 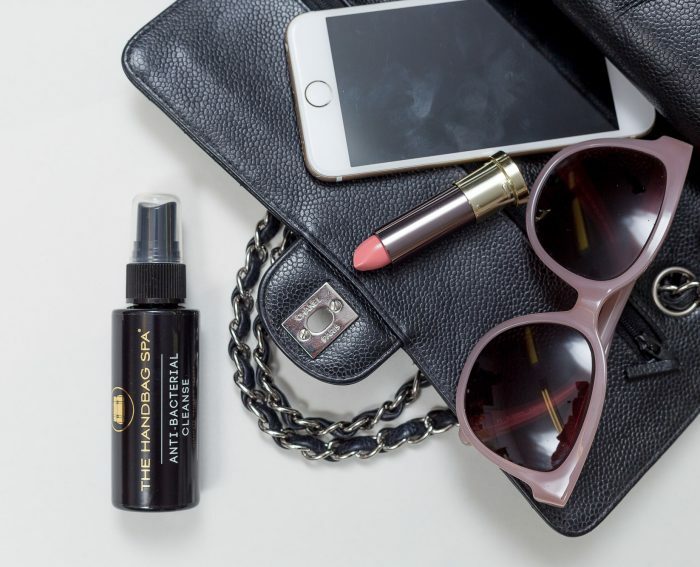 We have made it our mission to find an easy way to clean the germs off your handbag. Here at The Handbag Spa, we care about healthy handbags and have sought to eliminate the risk. The team have worked with the world’s finest leather chemists to create an antibacterial cleanser – proven to kill 99% of common bacteria! Anti-Bacterial Cleanse is the U.K’s only proven anti-bacterial killing product for this application, specifically designed for handbags. Not only that, but Anti-Bacterial Cleanse is effective on ALL types of leather and fabric – meaning you’re whole handbag and purse collection can be clean and bacteria free! Please note: You do not need to rub this product in or spot clean for Anti-Bacterial Cleanse to work. Be prepared for any emergency spillages and eliminate nasty bacteria on you beloved bag with The Handbag Spa’s ‘On-the-Go’ wipes. These antibacterial cleaning wipes are a much safer alternative to using baby wipes, which can damage your handbags finish and thus create a build up of product that’s hard to remove. These effective and affordable wipes are also great for cleaning handles and removing the build of dirt on linings. 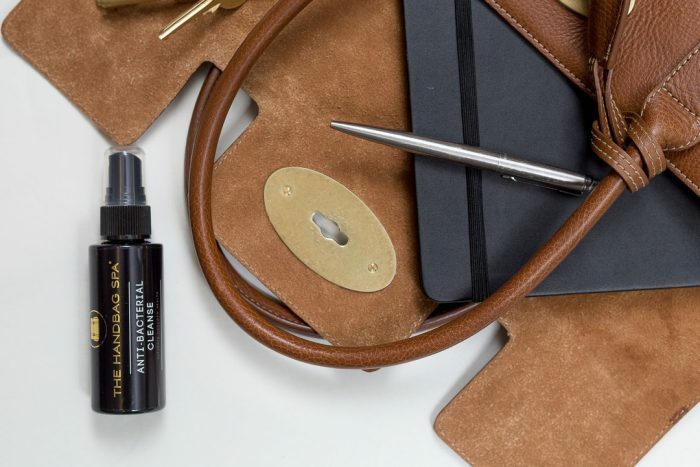 Like Anti-Bacterial Cleanse, On-The-Go wipes are safe to use on all types of fabric and leather. So they can be used on your whole handbag and purse collection! Please note: this product may darken unfinished leathers when first applied, but the leather will dry back to it’s original colour. 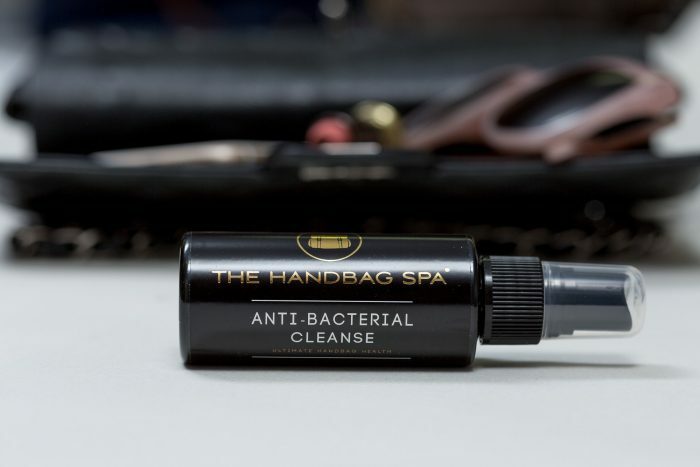 Anti-Bacterial Cleanse and On The Go Antibacterial Cleaning Wipes can be used on ALL types of leather and fabric, making it perfect for ALL handbags and purses! So finished and unfinished leathers, lambskin, exotic, suede, nubuck leather and all types of fabric (including coated canvas) can all be bacteria free. This means that all luxury designer handbags can be clean and germ free! – YSL Cassandre Tassle, Ligne Y Cabas, Muse and many more! NOTE: None of The Handbag Spa products will alter the look, feel or finish of a leather handbag in any way.